Golf – 18 well maintained holes in a beautiful river canyon setting which stays open all year except for occasional short lived winter snowfalls open to the public. 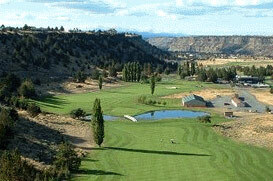 Fishing, Boating, Swimming – in the scenic Deschutes and Crooked Rivers. Affordable Destination Resort – for business conferences, reunions and weddings; motel, pool, tennis and basketball courts, ball field, restaurants, in/out door conference/meeting facilities, chapel, catering, mini-market. RV Park – full hook-ups, pavilion, showers, washers and dryers, and kids playground. Scenic Trail Riding, Hiking – Horse rentals and guided horse tours along many trails including scenic Steelhead Falls on the Deschutes River. Camping Picnicking – at the BLM and RV parks and by the pond and fountain at MacPherson Park plus boating and swimming in nearby Lake Billy Chinook and Round Butte Reservoir. Arts and Crafts Country – The 50 member CRR Artist & Crafters Guild sells its’ products at a summer store, the events below and a Christmas Bazaar the first weekend in December. Jazz In The Canyon Dixieland Festival – Three days of New Orleans style live jazz mid June 16-18 at the Big Dog Saloon and MacPherson Park. Annual Buffalo Roast – sponsored by the CRR Lions Club on July 4th weekend at MacPherson Park. Relaxed Ambience – “Ranchers” take care to preserve that quality in this quiet spot of wide open spaces and clean air away from the hustle and bustle of the city and welcome visitors who appreciate it too.